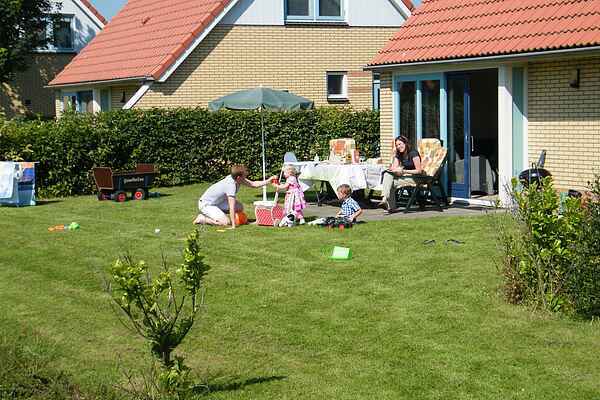 The spacious villa is fully equipped and ideal for families with young children. The villa sleeps seven adults and one child up to 3 years. All villas have two bathrooms, one is downstairs with bath and shower. The second bathroom is on the first floor with a shower and toilet. Everything has been done to make your stay as comfortable as possible. This is clear from the presence of a washing machine and dryer, a handcart, commode, of course a child bed and chair and safety gate, and the garden is fenced and closed because it is located near the water. You can let your children play in the garden with full peace of mind. Everyone can enjoy this well-earned relaxation.